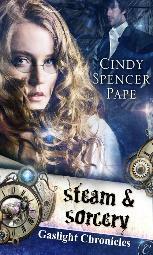 Book 1 of Cindy Spencer Pape's Gaslight Chronicles, "Steam and Sorcery" is a sweet romantic, steampunk read that takes a while to build up steam. (yeah - I went there. I couldn't resist.) I almost gave up on this after the first quarter of the book but forced myself to forge ahead. I think all the background story built up too slowly. Practically the first quarter of the book passed before the hero and heroine even appear together for more than a paragraph. I would have enjoyed this book more if the first half of the book could have been condensed into a few chapters. A few scenes were jarring to me as a historical romance reader even though the author provides an explanation. An example: the heroine, in her role as governess, is invited to dine at a dinner party - hosted by the hero's boss, a duke. The author provides an explanation, but it just didn't seemed historically accurate to the time period steampunk is set in. I understand she's not exactly of the same class as the downstairs servants, but she's not even a distant relationship or presented as such before the invite.